Today I am bringing to you a deleted scene from a Facebook friend of mine, Kaitlin Bevis, from her newly released book 'Persephone'! - If you visit http://kaitlinbevis.com/ you will find links to where you can find the book, apparently its also in audio format! She was beautiful. Hades hadn’t expected that. Silly really, the daughter of Zeus and Demeter would hardly be plain. He wasn’t sure what he had been expecting as he tore his way through the earth. He hadn’t taken the time to think, had only been advised of what was happening above his realm, and acted. She held her head high as the ice retreated. Her fists clenched in defiance as her white dress swirled around her petite frame. She had to be frightened. He could almost see her pulse hammering in her throat. Still, she stood calmly facing his chariot as he drew to a halt. He felt as though he was seeing the sun for the first time. Had she only been beautiful, he would have been able to tear his gaze away from her. He had seen no shortage of beauties in his long and lonely existence. Helen of Troy, Andromeda, even Oreithyia could not have matched this girl for beauty. It was the purity and intelligence sparkling from her cypress green eyes that held him captive. That she was still standing spoke of immeasurable bravery to say nothing of that defiantly clenched fist. He loomed over her, in his black chariot. He was trapped in her gaze, unable to move forward. His mind kept repeating an endless refrain of thanks that he had not been too late. Another thought kept edging to the forefront of his brain. He tried to shove it back unsuccessfully. That she would complicate his life beyond measure was of no importance. Demeter would be furious. If this begat a war with the few gods left, so be it. Cassandra had warned him this would happen one day. Gods help him; he’d thought she was kidding. Kaitlin Bevis spent her childhood curled up with a book and a pen. If the ending didn’t agree with her, she rewrote it. Because she’s always wanted to be a writer, she spent high school and college learning everything she could to achieve that goal. 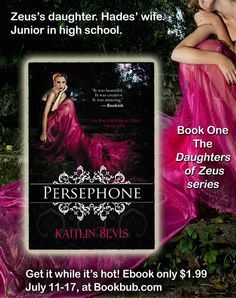 After graduating college with a BFA and Masters in English, Kaitlin went on to write The Daughters of Zeus series. You are so very welcome!!! Congratulations on hitting Amazon's best seller list! Good luck during your sale!! !